WASHINGTON (AP) - A draft executive order obtained by The Associated Press shows that President Donald Trump intends to stop accepting Syrian refugees and suspend the United States' broader refugee program for 120 days. The president also plans to suspend issuing visas for people from Iran, Iraq, Libya, Somalia, Sudan, Syria or Yemen for at least 30 days, according to the draft. All are predominantly Muslim countries. Trump is expected to sign the order this week. It was not clear if the draft will be revised before then. The actions would continue Trump's rapid-fire attempts in his first week as president to move forward on signature issues of his campaign: cracking down on illegal immigration and blocking the entry of people from countries where terrorist organizations have a significant presence. 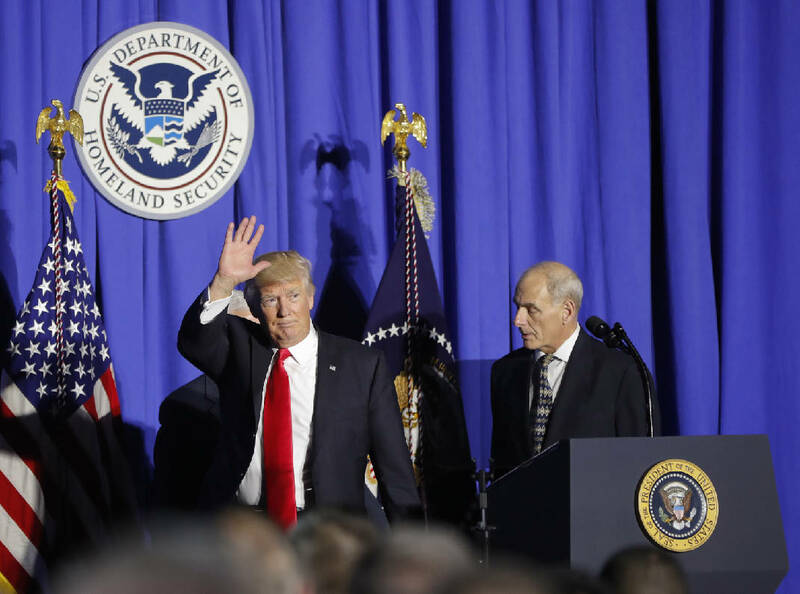 On Wednesday, Trump issued orders aimed at moving ahead with a wall on the Mexican border and blocking federal funds from "sanctuary cities" that protect immigrants. Trump's draft shows that he will order Homeland Security and State Department officials, along with the director of national intelligence, to review what information the government needs to fully vet would-be visitors and come up with a list of countries that don't provide it. The order says the government will give countries 60 days to start providing the information or citizens from those countries will be barred from traveling to the United States. Exceptions would be made for diplomats, NATO visas or those people traveling to work at the United Nations. During the campaign Trump, said vetting procedures were inadequate and suggested that terrorists could pose as Syrian refugees to infiltrate the United States. Under the Obama administration, vetting for Syrians routinely took years to complete and included in-person interviews overseas, where they provided biographical details about themselves, including their families, friendships, social or political activities, employment, phone numbers, email accounts and more. They also provided biometric information about themselves, including fingerprints and Syrians are subject to additional, classified controls that administration officials at the time declined to describe. While suspending visas for Syrians, Trump is also asking that officials from the departments of State and Defense to draft plans for safe zones in and around Syria. Trump has the authority to determine how many refugees are accepted annually and he can suspend the program at any time. Refugee processing was suspended in the immediate aftermath of the Sept. 11 attacks, restarting months later. During the last budget year, the U.S. accepted 84,995 refugees, including 12,587 people from Syria and President Barack Obama had set the refugee limit for this budget year at 110,000. Trump, according to his yet-to-be-signed executive order, will cut that program by more half to 50,000. The order said while the program is suspended, the U.S. may admit people on a case-by-case basis "when in the national interest" and the government would continue to process refugee requests from people claiming religious persecution, "provided that the religion....is a minority religion in the individual's country." That suggests that would allow the admission of Christians from Muslim-majority countries. Trump's order also directs government officials to make a variety of changes to how visas are issued, including requiring that everyone applying for a non-immigrant visa be interviewed in person. Previously, waivers could be granted to skip the interview. The order says its purpose is to make sure anyone allowed to enter the United States doesn't "bear hostile attitudes toward our country and its founding principles." "We cannot, and should not, admit into our country those who do not support the U.S. Constitution, or those who place violent religious edicts over American law," Trump said in the order. He added that the U.S. should bar foreigners who "engage in acts of bigotry and hatred," citing honor killings or other violence against women and religious persecution. There is no religious test to enter the United States and the Immigration Act of 1990 all but eliminated the government's ability to exclude would-be immigrants on ideological grounds. But it does allow the government to block someone from the country if their "entry or proposed activities in the United States....would have potentially serious adverse foreign policy consequences."